Scott M. Stringer, the 50th New York City Comptroller since 1802 and fiduciary of the fourth largest U.S. public pension fund, is pleased but not content. His Boardroom Accountability Project has helped push to 235 the number of publicly traded U.S. companies providing shareholders or shareholder alliances holding at least 3 percent of a company's stock for at least three years the ability to nominate up to 25 percent of the company's directors using the corporate ballot. “So you can see there's real change here,” he said in a recent interview with Bloomberg BNA's Stephen Joyce. To expand proxy access to thousands of companies, Stringer tells Bloomberg BNA that he favors a Securities and Exchange Commission rule mandating proxy access at all corporate registrants. An SEC August 2010 final rule requiring proxy access was vacated by a 2011 court decision: `Business Roundtable v. SEC,' 647 F.3d 1144, 2011 BL 213255. Of the total number of companies specifically targeted by Stringer's Boardroom Accountability Project (excluding companies receiving proposals from other investors in some way affiliated with the project), 86 companies have adopted proxy access bylaws that closely mirror the Securities and Exchange Commission's invalidated rule, which allowed investors that have held 3 percent or more of a company’s stock for at least three years to nominate up to a quarter of the board on the corporate ballot. Five additional companies have enacted access bylaws that are more restrictive, typically requiring a larger percentage of shareholders than called for in the SEC measure. You launched the Boardroom Accountability Project in time for the 2015 proxy season. How successful has the initiative been in its first two seasons? In the fall of 2014 when we announced the Boardroom Accountability Project, only six companies had real proxy access. In just two years, we have seen that number grow to 235. That's pretty good. Some people refer to you as an activist investor. Are you comfortable with that term? I wouldn't say I'm an activist investor. But I am an active long-term investor with large holdings. When you think about our investments—we have shares in 10,000 companies worldwide, including 3,500 that are U.S. based—if we have concerns about the boards we can't just walk away. So the only way we can protect long-term value is to be active owners and to make sure we have the right directors in the boardroom. And that's why we have proxy access. How many city workers and retirees are supported by New York City pension funds? About 700,000: 350,000 retirees and 350,000 employees. I have to protect their retirement security. This is what keeps me up at night. The Boardroom Accountability Project in proxy season 2016 targeted 72 firms for proxy access campaigns based on three criteria: executive compensation, board diversity and climate risk (08 CARE, 1/13/16). When you approach corporate boards about proxy access, are you welcomed warmly or do they run in the other direction? As with many things, I would say the treatment is somewhat uneven. You have to look at this on a case-by-case basis. There has been, overall, a sea change in the way most boards respond. Instead of stonewalling, we're now seeing constructive conversations. This year, 52 out of our 72 targeted companies agreed to proxy access before a single vote was cast, and therefore we withdrew our proposal. The biggest success is that companies are adopting proxy access before the issue is even voted on. That is a welcome and important development. It speaks to an overall trend in the market towards proxy access. Now that you have it, do you plan to use proxy access to nominate slates of directors? We will use it if it's appropriate to use it. It's a tool we are prepared to use in the right situation, but it's not necessarily the first step—and it shouldn't be. Proxy access is a nuanced tool. It allows us to engage directly with boards about our areas of concern, and it does give us a little leverage to make boards more responsive. But everyone knows proxy access is not radical by design. It's a tool that will be rarely used. Look, even the specter of proxy access will create better practices in the boardroom because there is a sense that we have this tool. And hopefully that will make the board engage constructively. I want companies to do well. The Securities and Exchange Commission approved in 2010 a proxy access rule that was a year later vacated by the U.S. Court of Appeals for the District of Columbia Circuit. You've said in the past you were in favor of the rule. 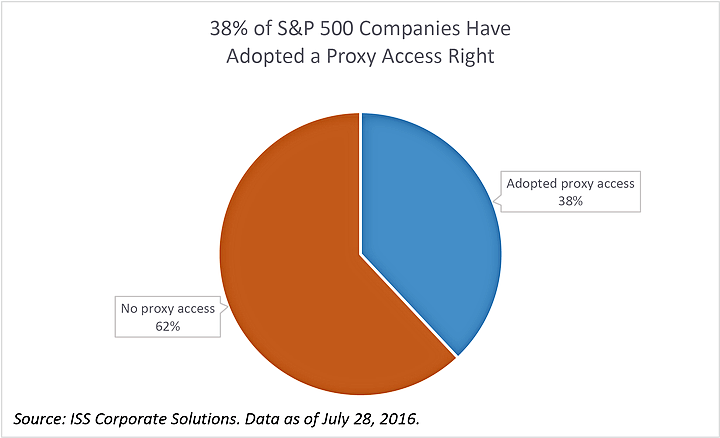 Do you still want the SEC to create a mandatory proxy access rule? My goal is to make proxy access an industry standard. I would prefer an SEC rule that would ensure a uniform standard across the market. But we're not waiting for federal action. We're going to continue to go company by company until we have a market standard. What goals do you have for the Boardroom Accountability Project for the 2017 proxy season? I don't know what we're going to be doing in 2017, but we're moving forward. Look, we've made extraordinary progress in two years. 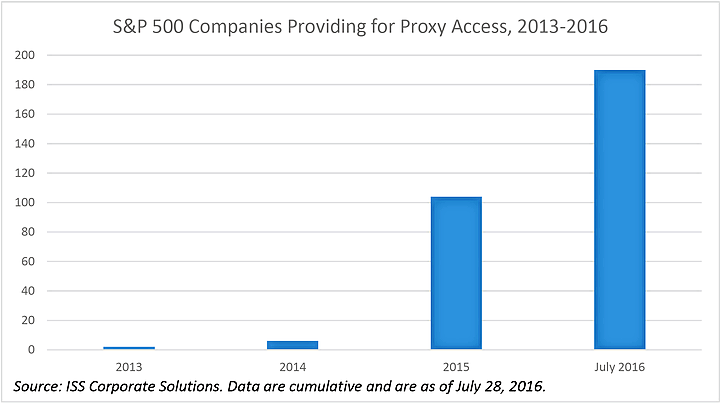 I mean, 235 companies have proxy access; by one measure nearly 40 percent of the S&P 500. So, we're moving forward. Stay tuned. A list of companies targeted by the Boardroom Accountability Project during the 2016 proxy season is available at http://comptroller.nyc.gov/boardroom-accountability/2016-focus-boardroom-accountability/.